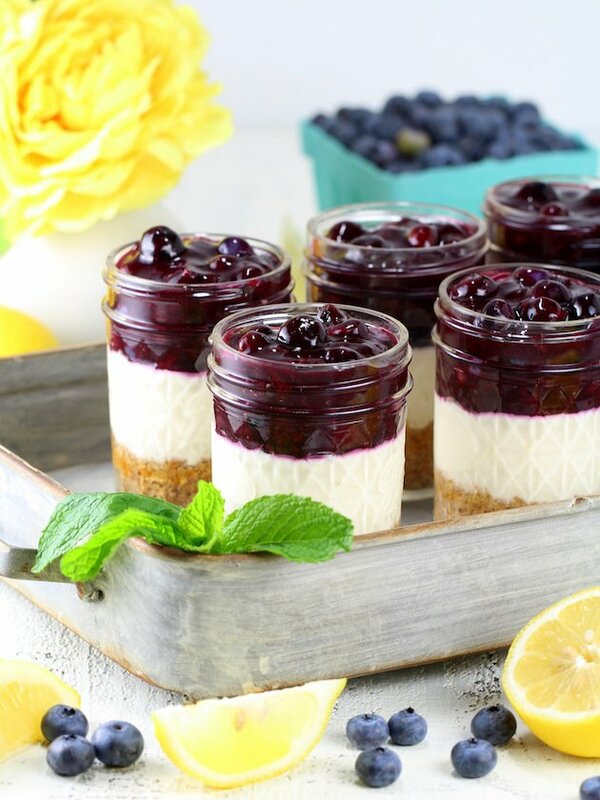 Blueberry Lemon No Bake Cheesecake Jars – an easy and delicious make-ahead summer dessert! Plus, they’re perfectly portable for your next BBQ, picnic or trip to the beach! 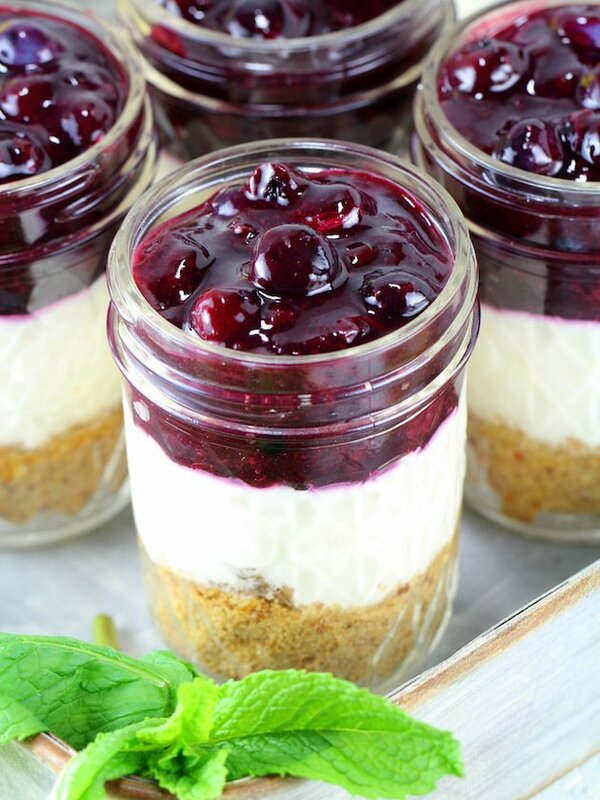 These yummy treats are lightened up with a graham cracker almond crust, a sweet cream cheese lemony Greek yogurt layer, and a delightful homemade blueberry sauce. Don’t you just LOVE fresh blueberries? And don’t you love getting the two-for-one special on them during blueberry season!?? Yep – crushed that the last two weeks! It’s almost impossible to pass up such a fabulous deal. 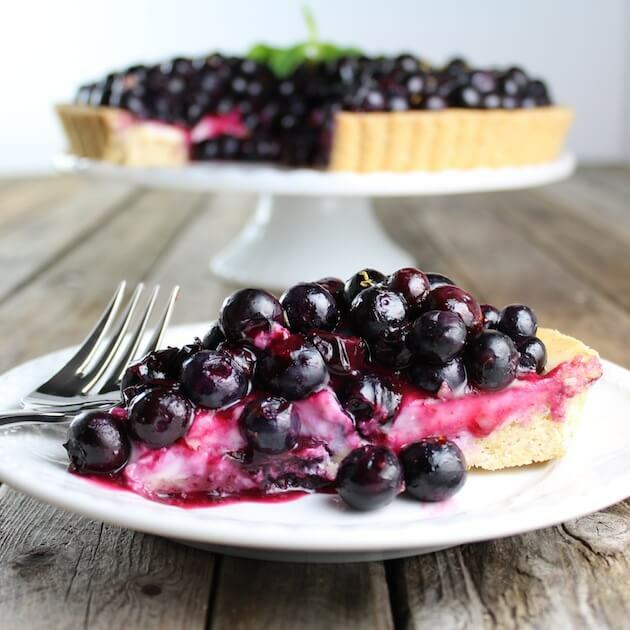 In North America blueberry season runs from April – September, but you can still enjoy blueberries all year round: imports from South America are available in the winter and spring. So we never have to go without these tasty sweet treats. Blueberries thrive in hot days with clear blue skies and cool nights. 38 states in the US grow blueberries commercially, but just ten states account for almost all commercial production: California, Florida, Georgia, Indiana, Michigan, Mississippi, New Jersey, North Carolina, Oregon and Washington. Most of these states offer U pick blueberries as well. So rather than just grabbing some at the grocery store, you can pack a lunch and head out for a fun summer activity with the kiddos or your girlfriends. To find your own U pick berries just do a Google search of “Blueberry picking near me” that should get you started. Blueberries have more antioxidants than any other berry, and they are considered a low-calorie snack… there are just 160 calories in a pint. One serving of blueberries provides 25% of your daily vitamin C.
You probably already guessed this but there’s virtually no fat in a raw one-cup serving of blueberries – just 0.5 grams ! Blueberries are a great source of dietary fiber. If you’re wondering How much fiber in blueberries, there’s 3.6 grams in a one-cup serving. And as far as carbs in blueberries… well, surprisingly enough fresh blueberries are relatively low in carbohydrates as fruit goes. Only 21 grams in 1 raw cup. Now I’m sure you can see why they’re basically the best berry ever! Annnd they make the best blueberry topping for cheesecake!! 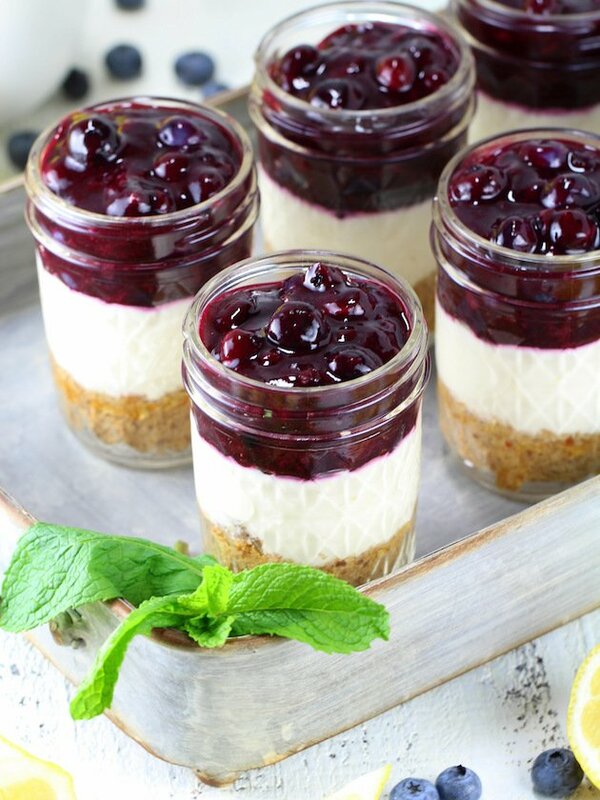 Shall we talk about how to create these mouth-wateringly delicious Blueberry Lemon No Bake Cheesecake Jars!?? You start with 2 pints of blueberries. Essentially, you’re making a blueberry pie filling. 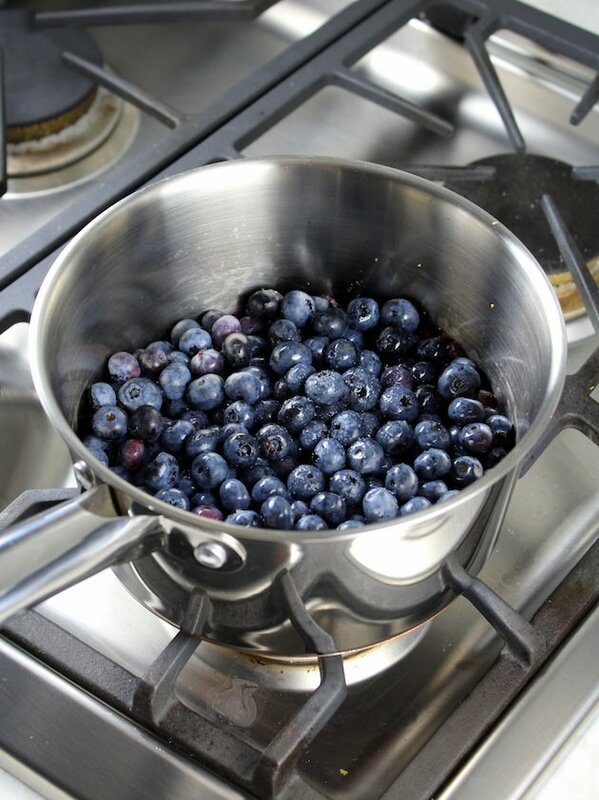 Add blueberries, lemon juice, & pure maple syrup (or honey) to a sauce pan over low-medium heat. Sauté for 5 minutes, gently stirring the berries now and then. When the berries begin to form a sauce, add in some cornstarch mixed with a little water. Cook them for a few more minutes until it’s thickened up, but you should still have some whole berries visible. Pour the berries into a heatproof container and allow to cool on the counter or in the fridge while you make the lemon cheesecake filling. The Secret To An Amazing No Bake Cheesecake! 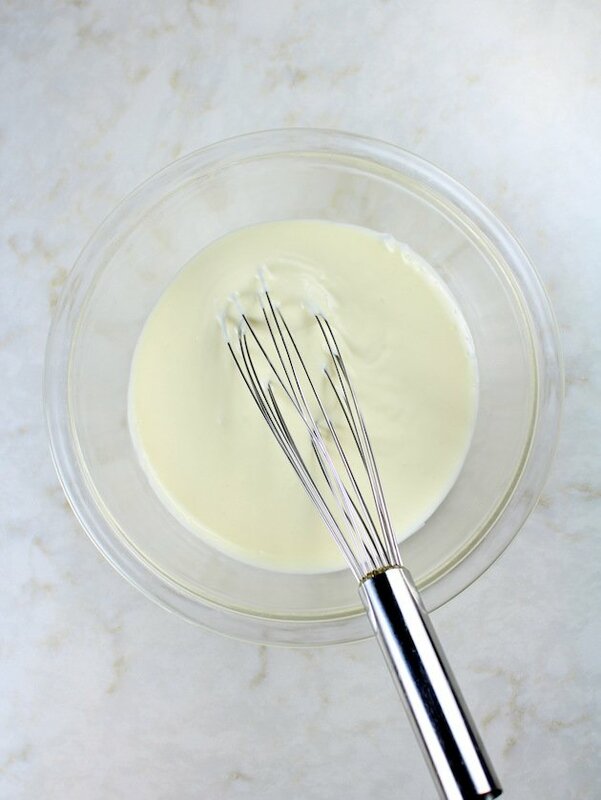 You’re going to love this: just add 8 ounces of softened cream cheese, 5 ounces of plain Greek yogurt, maple syrup, fresh lemon juice, and lemon zest (if desired) to a mixing bowl and mix together using a whisk – or even better an electric hand mixer (I mixed mine for 2 minutes on high). Now set this in the fridge while you create the crust. 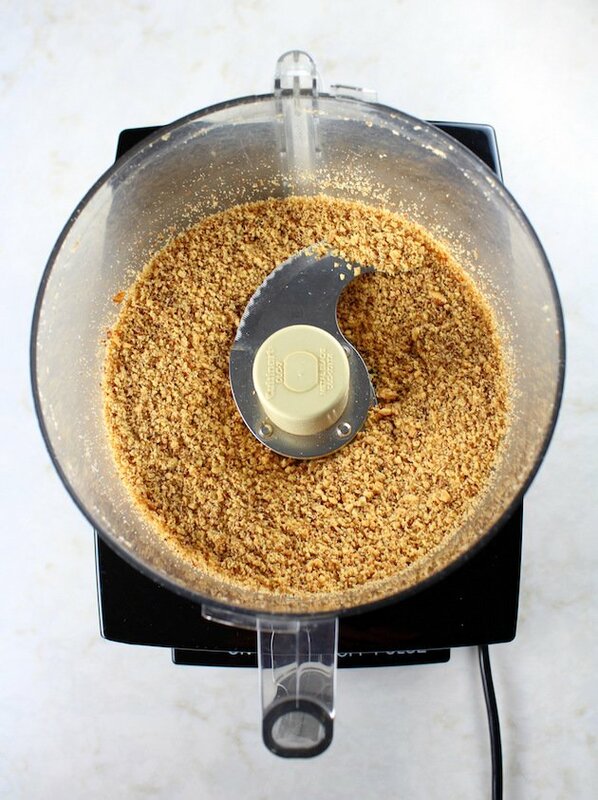 Add almonds to a food processor and blend until the nuts are crushed very fine, but don’t let them start turning into almond butter! 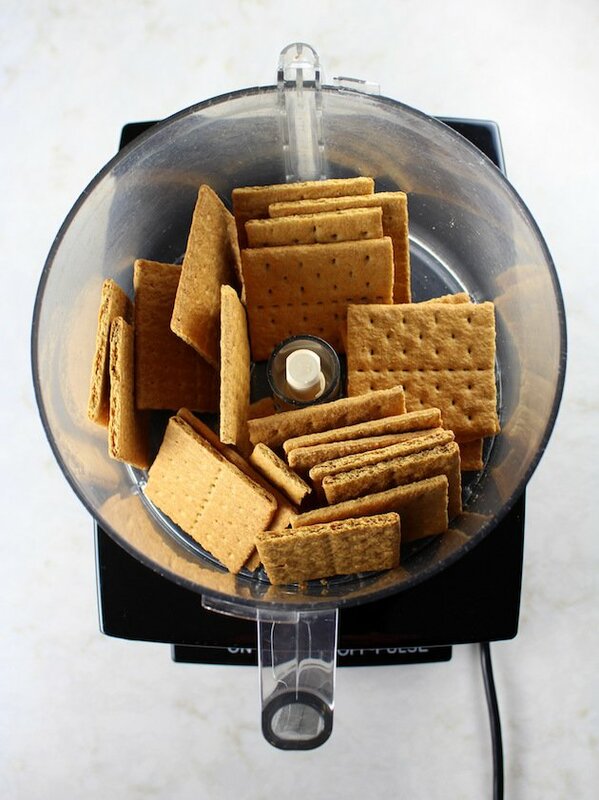 Pour them into a mixing bowl, add your graham crackers to the food processor and blend until they are crushed fine. 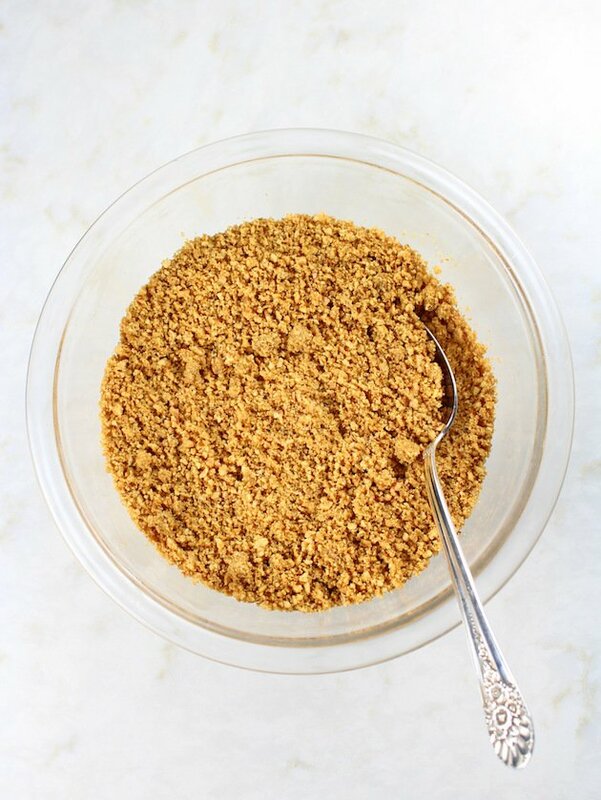 Mix the graham crackers into the crushed nuts, drizzle on melted butter and a pinch of salt, and stir until it’s completely mixed together. Now it’s time to assemble. Add 1/3 cup of the crust to six 8-ounce mason jars and gently pack with your fingertips. Now carefully divide the cheesecake layer evenly among the jars. Finally, top off each jar with the blueberry sauce, place the lids on top, and chill for at least 1 hour or up to 1 day. 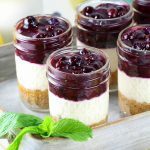 The crunchy buttery crust with the creamy lemon no bake cheesecake topped off with THE most delicious blueberry pie filling – doesn’t it look and sound amazing??? I’m sure these are going to be your family’s new favorite summertime sweet treat! I would love to connect with you! Follow me on Instagram, Twitter, Facebook, and Pinterest! An easy and delicious make ahead summer dessert! Plus, they’re perfectly portable for your next BBQ, picnic or trip to the beach! 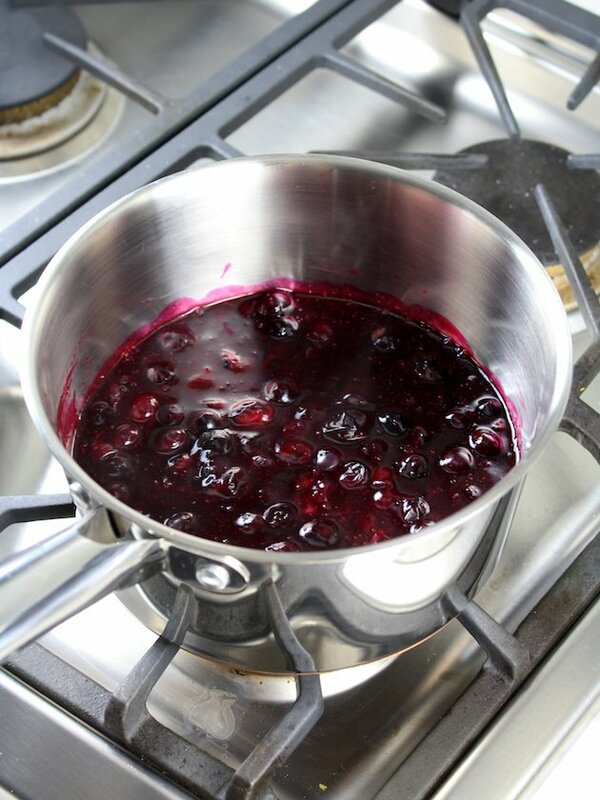 Add blueberries, pure maple syrup (or honey), lemon zest (optional), & lemon juice to a sauce pan over low-medium heat. Sauté for 5 minutes, gently stirring the berries occasionally. Mix cornstarch and water in a small bowl. As the berries begin to form a sauce, add the cornstarch mixture and cook for a few more minutes until the sauce has thickened up. You should still have some whole berries visible. 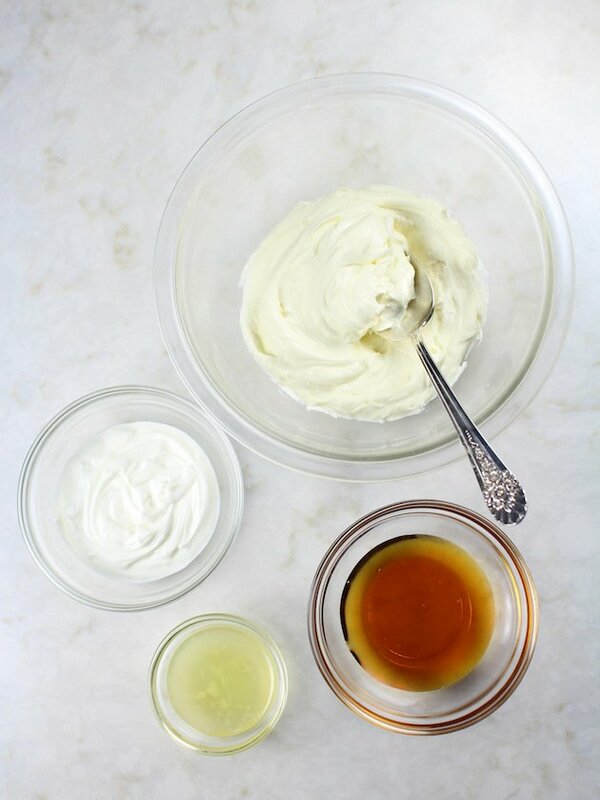 Add softened cream cheese, plain Greek yogurt, maple syrup, lemon zest, and fresh lemon juice to a mixing bowl, then mix together using electric hand mixer (I mixed mine for 2 minutes on high). Set this in the fridge while you create the crust. 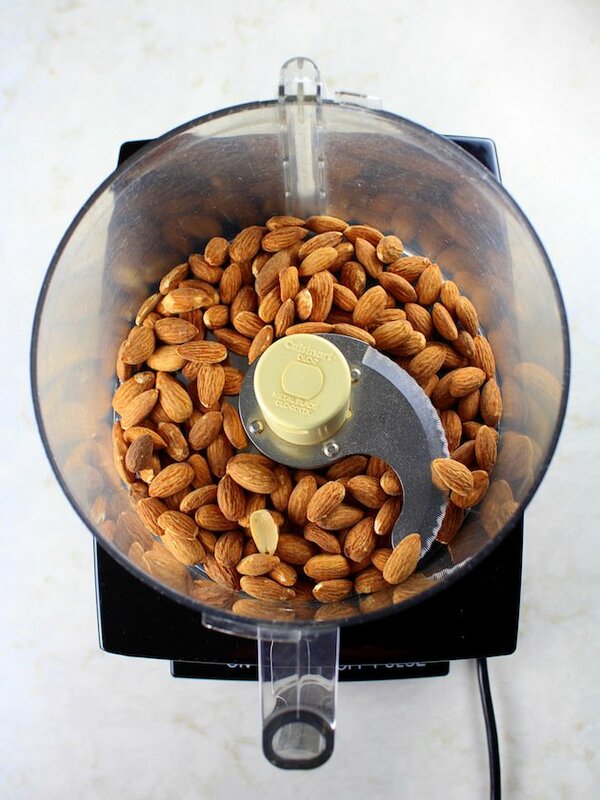 Add the almonds to a food processor and blend until the nuts are crushed very fine, but don’t let them start turning into almond butter! Pour nuts into a mixing bowl. 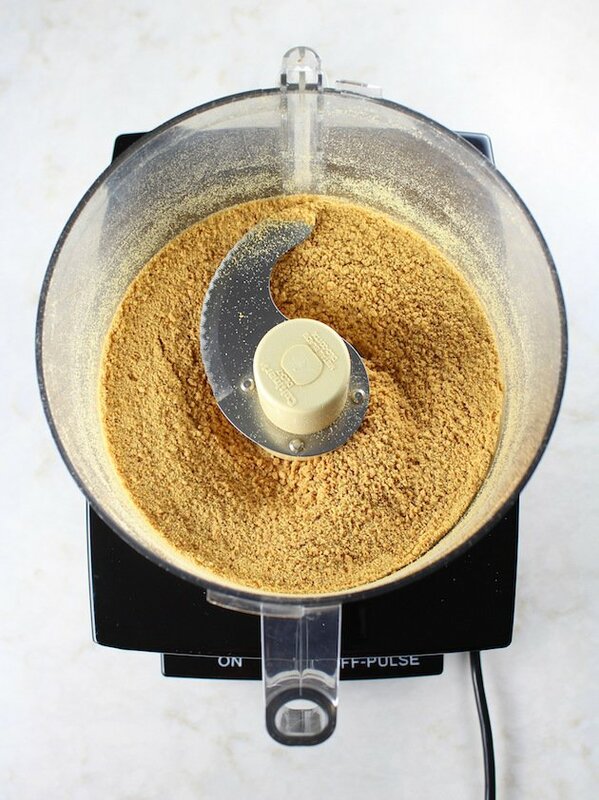 Add graham crackers to the food processor and blend until they are finely crushed. 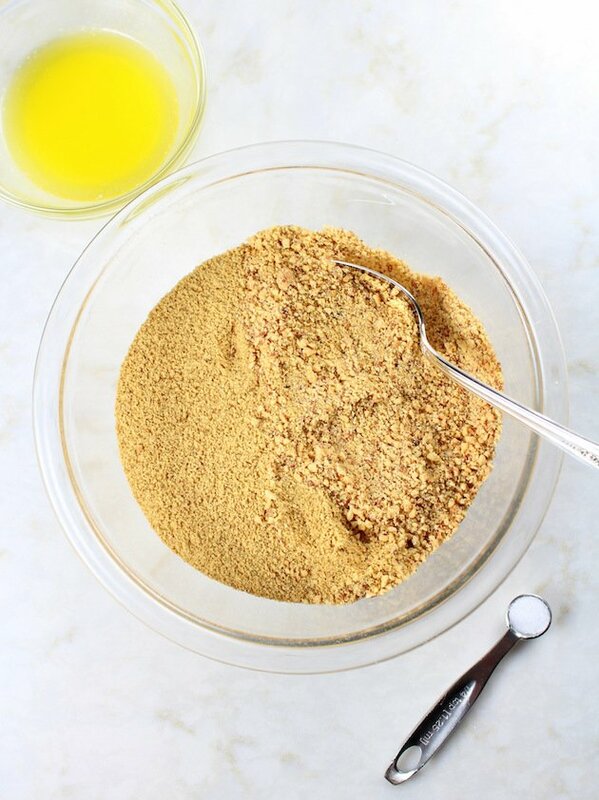 Mix the graham crackers into the crushed nuts, add salt (optional), drizzle on melted butter, and stir until it’s completely mixed together. Distribute crust mixture evenly into six 8-ounce mason jars, about 1/3 cup per jar. Pack down gently with your fingertips. Carefully divide the cheesecake mixture evenly among the jars - about 1/3 cup per jar. Gently shake each jar to help this layer settle evenly. 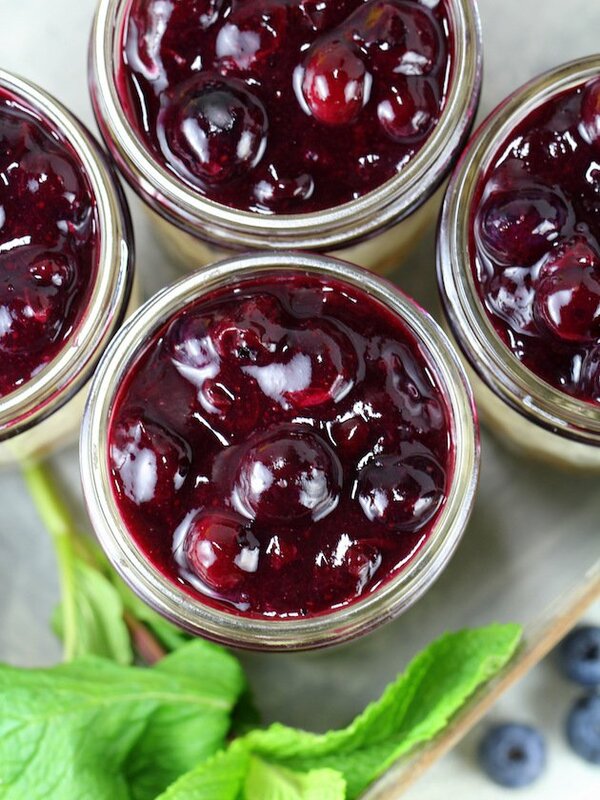 Finally, top off each jar with the blueberry sauce, place the lids on top, and chill for at least 1 hour or up to 1 day before serving. If you'd rather not use almonds in the crust, you can add more graham crackers instead. Just replace the 5 ounces of almonds with a second 5-ounce sleeve of graham crackers. You may want to add another pinch of salt as well. Looking for more amazing summer berry desserts? What size jars work the best for this recipie? Hi Andrea! This recipe calls for 6 eight-ounce mason jars. Hope you love it!! Cute idea putting these in jars — makes it so easy to serve for parties or portion control. The fresh lemon zest and fresh blueberries are the key! Thanks so much, Judy! I agree these are perfect for entertaining or even a grab-and-go dessert! I love making individual desserts. Blueberry cheesecake is so perfect for this. The layers really make a beautiful presentation. Thank you, Amanda! I’m a big fan of simple and delicious desserts! And when they’re healthy-ish it’s even better! Mine too, Veronika! They are just so adorable you know they’re gonna get a great reaction from your guests! These are so beautiful! I love anything in mason jars! These seem like a top candidate for my next picnic or concert at the Hollywood Bowl. Thanks so much, Jessica! They’re great for a grab-and-go dessert! Plus, they’re just too cute! These look delicious and I love that they’re no bake! Perfect for these 90-100F days we’ve been having. Can’t wait to whip up a batch. Thank you, Claire! I’m a huge fan of easy no bake desserts! Loving this post and your pictures are STUNNING!! Love all those blueberry nutrition points!! 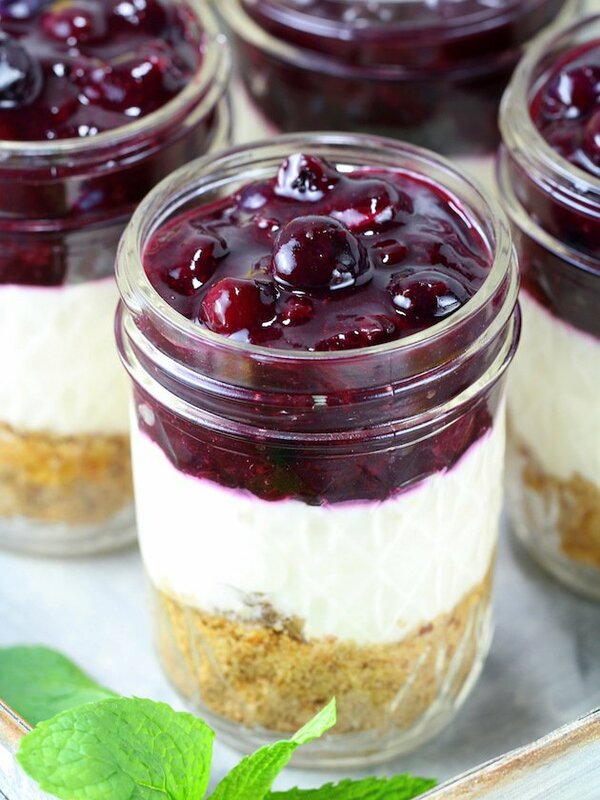 I’m in Phx AZ and unfortunately – we dont have blueberry bushes BUT they have a ton at the grocery store and this recipe looks beyond delish!! Cant wait to try this one!! I love the flavors you have in these jars. Blueberry and lemon is my favorite combination and this looks so pretty. Can’t wait to try. Thank you so much, Veena! I share your fondness for the blueberry and lemon combination! It’s like the perfect combination of tart and sweet. 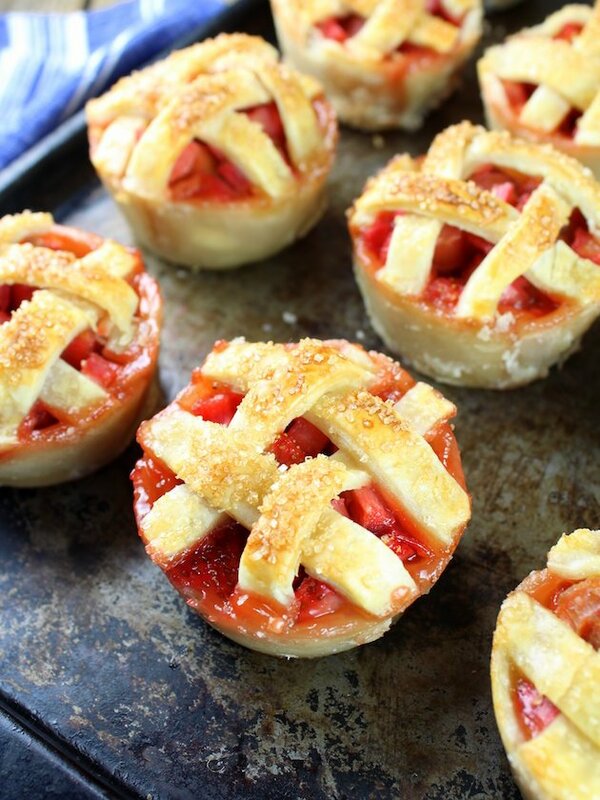 These are so pretty, and these would make such a better presentation for guests than a syrupy pie! I completely agree, Leslie! Thanks so much! I love that their cuteness is all contained in those little jars until it’s time to indulge. Mmmm, so making this next week. Perfect little dessert and no-bake, yay!! Yayy! Love that, Erin! Aren’t they just adorable!?? Hehe! Bluetiful fruit! Love that. These no-bake cheesecake bars look so delicious. I love how transportable they are and quick and easy they look to make. I love that you caught that, Elaine! I love a good blueberry dessert and even better if it’s quick and easy! Thank you! I LOVE the homemade blueberry topping. And the addition of lemon is spot on! Thank you, Kristen! 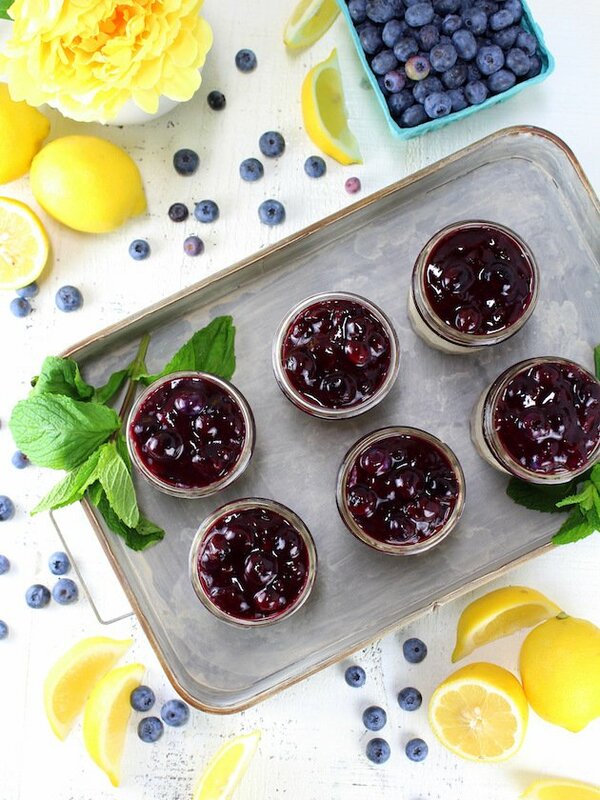 There’s nothing like fresh blueberries made into a sauce – so yummy! I love individual desserts, and this one looks delicious! I love that you use yogurt, I’m saving this to make soon. Thanks so much, Anne! I’m always looking for ways to make make recipes stealthy healthy but still super delicious! I hope you enjoy them! Aww thank you, Nicoletta! You’re so kind! Yum! I love the individual cups! I’m a huge cheesecake fan. Thanks so much, AZ!! I’m all about the no bake desserts this summer.